Recent work on verb clusters within Continental West-Germanic has argued in favor of restrictive theories of cluster orders that only generate a subset of the logically possible orders in three-verb clusters, explicitly ruling out the 213 order. In this context it is remarkable that Swiss German features a verb cluster-like construction with an unmarked 213 order. I will argue that this construction indeed represents a proper verb cluster and not an instance of the 3rd Construction, which also allows the 213 order. Based on new diagnostics, viz., stranding of VP3 under topicalization of the governing VP2, short relative clause extraposition and displaced zu, I will show that verb clusters and Verb Projection Raising differ from the 3rd Construction with respect to the structural position of the dependent VP: while the dependent VP is contained within the projection of the governing verb in the former, it occurs outside of the projection of the governing verb in the latter. Applying the diagnostics to the Swiss German 213 construction delivers a clear result: the construction patterns with verb clusters rather than the 3rd Construction. I conclude from this that theories of verb clusters and unmarked word order more generally must be able to generate all six logically possible orders, including the 213 order. Salzmann, Martin. 2019. Displaced morphology in German verb clusters. An argument for post-syntactic morphology. 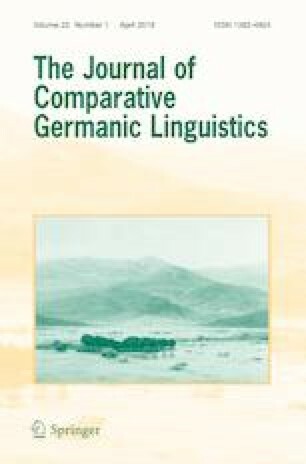 Journal of Comparative Germanic Linguistics 22(1):1–53. https://doi.org/10.1007/s10828-019-09103-y.